I’ve been questioned several times about adequate rib width for post tension slabs. For most people it makes perfect sense to simply use the rib width as the only bearing area when determining soil bearing pressure. That’s how a wall on grade or footing foundation works as the basics learned in school. However, post tension slabs are more than just a rib bearing on soil. The entire slab is also bearing on the soil and can distribute a surprisingly large amount of load. 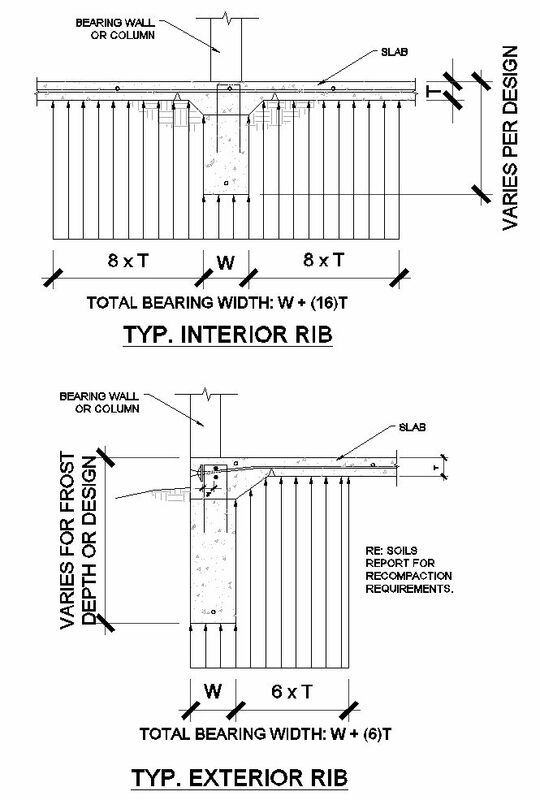 The Post Tension Institute manual states that an engineer may consider using the rib width PLUS 16 times the slab thickness at interior ribs and 6 times the slab thickness at exterior walls. For example; a typical slab thickness is 5”, so the engineer may increase the bearing width at interior ribs by 80” PLUS the rib width and exterior ribs by 30” PLUS the rib width. This makes a significant difference. This should allow the engineer to stay with a typical 10” to 12” rib width and provide the best value engineering. The only time I need to increase rib widths or provide thickened slabs is at large point loads. And, due to the base plate attachment at these large point loads you need to thicken the slab anyways. However, I have decided to reduce these allowable bearing areas at significant point loads and other locations I’m concerned about exceeding the soil bearing. One area to consider is corners of a slab with a large point load. Since the slab is not continuous in each direction of the rib, I have decided to reduce the allowable factor of 6 to 3 times the slab thickness. Another concern about the allowable increases is the assumption that the soil capacity adjacent to the ribs meets the geotechnical engineer’s specified bearing capacity. In the field you can clearly identify loose soil to either side of most ribs due to the fact most ribs are cut into the soil using heavy machinery. When the ribs are cut, the soil is disturbed at the top edges of the trenches. So be smart about what you can do versus what you should do when designing! Another caution to structural engineers designing foundations is to make sure you understand what the loads are if provided by another structural engineer designing the frame. I typically receive a ground floor plan with the line loads and point loads indicated to use for the foundation design. First, the loads are generally total loads with no indication about the percentage of live load versus dead load. Generally, not an issue since we are only concerned about the total bearing force on the soil. Second, the loads are usually rounded up, sometimes rounded up by a lot. I recommend adding up a few tributary areas to make sure the loads provided make sense. Finally, you may want to consider getting something from the other structural engineer stating you can use appropriate live load reductions per IBC 1607.9.1 and 1607.9.2. If you have any other questions about post tension design or need a structural engineer who knows it, please contact us. As a kid I loved to build with LEGOS or anything else I could find. I would spend hours making planes, buildings, and whatever else a kid’s imagination could think of. Now the LEGO pieces are bigger. I consider myself to be very lucky to be an engineer and continue to design with building blocks. At first, structural engineering wasn’t at the top of the list. My heart was set on Aeronautical Engineering designing airplanes and spacecraft. But before I started at Purdue, I realized there aren’t too many job openings for aeronautical engineers. I’ve never regretted my choice. It seems structural engineering goes unnoticed with little recognition. I believe a good structural design should go unnoticed. That demonstrates you were capable of allowing the architect‘s concepts work. With that said, the best award is repeat clients and recommendations. That’s proof you are doing a good job and keeping the client’s priorities in mind. In addition, I have been very lucky to have designed homes for the Parade of Homes and to be a part of the celebration. Boiler up! OK, well I’m not a big fan of the “Boiler up” cheer, but it was started by football coach Joe Tiller’s wife and I have a lot of respect for the Tiller family. Unfortunately, he is no longer coaching and they have moved back to Wyoming, hence, the “Boiler up” coming from “Cowboy up”. I loved going to Purdue. Yes, it’s in the middle of corn fields in Indiana, but a wonderful college town and a beautiful campus. Purdue is one of the top ranked engineering schools in the world. At the time I went there, I believe the Civil Engineering was ranked #2. I’m very lucky to have been accepted and to have survived! I still remember freshman orientation and the day all of the freshman engineers were required to attend a lecture and asked to dump their girlfriend that night, forget about any hobbies and learn to survive on only 4 hours of sleep every night. Well, I maintained a long distance relationship all four years, took up a new hobby (partying) and decided sleep was more important than going crazy. HAVE WE HEARD ABOUT ANY OF THE PROJECTS THAT YOU’VE DONE? Unless you live in cave, I’ve done work for most of the home builders in Colorado. Some of the Homebuilders that have stood out over the years are Oakwood Homes, Infinity Home Collection, Lennar, KB Homes, Beazer Homes, Meritage Homes and Capital Pacific Homes. The KB Home Martha Stuart Collection has probably received the most media. I was also the structural engineer for the Parade of Homes at Daniels Gate and Stapleton for Infinity Home Collection and Woodley Architects. That was a lot of fun being a part of the parties at the Parade of Homes. Other than home builders, a couple projects I enjoyed was designing the post tension foundation for Big Horn Plastering located by the Broncos practice field, a three story hotel for the Yavapai Indian Tribe in Prescott, AZ and Lincoln Station at the Lincoln light rail station. However, due to the economy it sounds like Lincoln station may never break ground. COULD YOU TELL US MORE ABOUT YOUR FAMILY? I met my wife, Kate, on a blind date to the senior year homecoming dance. I was scared to death that night, but I must have done something right. Kate and I have been together ever since and happily married for over 9 years. 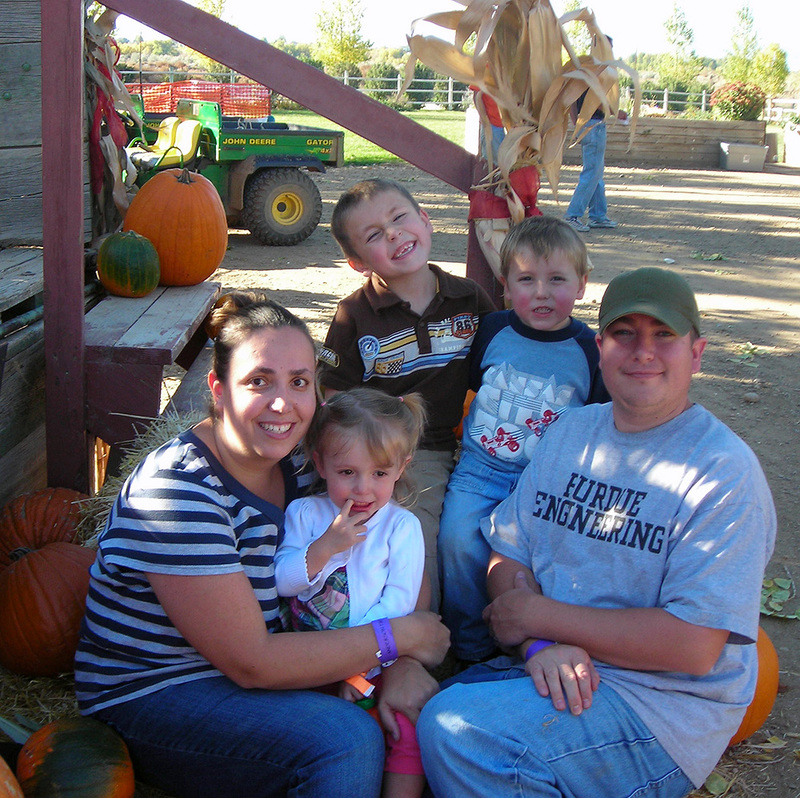 We have three wonderful children, Kyle 7, Sean 5 and Elizabeth 3 in August. Elizabeth goes by Lizzie or “Baby Boss” if she is keeping the boys in line. Most evenings are spent at soccer or baseball practice/games or playing in the backyard. It’s a blast watching little kids get out there and play. My wife and I volunteer to coach the boys’ soccer teams. We loved doing it and look forward to next summer. During the school year my wife and I volunteer for the PTO. Kate, my wife, has been the vice president for two years and now entering into her second year as president of the board. So that unofficially makes me the PTO whipping boy. I’m kidding of course, and we have a lot of fun helping with the carnival, three dances, fund raisers and everything else that goes on. My family and I also enjoy going up to the mountains. The kids are still young and not too sure about camping. They have got in their heads that bears are all over the place. But we have lots of fun exploring new places. Otherwise, we fill our remaining time with trips to the local swimming pools and bike rides along the Highline canal. You are currently browsing the archives for the Jim Houlette category.